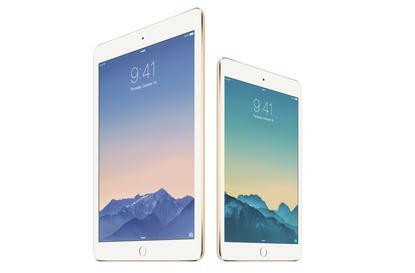 Apple’s range of iPads have received a refresh with the iPad Air 2 and the iPad Mini 3. The iPad Air 2 stays true to the Air moniker by stealing the "world's thinnest tablet" title from Sony's Xperia Z2 Tablet. Apple’s Touch ID has been incorporated into the new iPad. The technology will enable people to biometrically lock their iPads and authorise online transactions with the swipe of a finger. The 9.4in display of the Air 2 stagnates at its 2048x1536 resolution; however, Apple has bonded the LCD screen to the glass in a move that will reduce screen reflections. Improvements inside include a 64-bit Apple A8X chip joined by the M8 co-processor, an 8 megapixel camera and a battery that Apple claims will deliver 10 hours of use. The iPad Mini 3 was also announced this morning. Few changes characterise the smaller tablet other than the inclusion of Touch ID. Online orders for the iPad Air 2 and Mini 3 open tomorrow, 18 October, with Apple ambiguously claiming the iPads will be available in stores "starting later next week". The next generation iPads will help Apple increase tablet sales at a time when the market is saturating. Research firm Gartner claims tablets will represent only 9.5 per cent of total worldwide sales of devices in 2014, with growth slowing from 55 per cent year-over-year in 2013 to 11 per cent this year. Apple's iPad Air 2 will compete against Google's Nexus 9 tablet, an 8.9in Android tablet with a 64-bit architecture which was unveiled globally yesterday. The company also announced a 5K 27in iMac and updates to its Mac Mini range. Pricing for the iPad Air 2 starts at $619 for the 16GB Wi-Fi only model, and $779 for the 16GB 4G model. The 128GB versions of the will retail for $859 for the Wi-Fi only model and $1019 for the 4G version. The iPad Mini 3 starts from $499 for the 16GB Wi-Fi only model and $659 for the 16GB 4G model. The top of the range iPad Mini 3 with 128GB of internal storage and 4G will retail for $899.